The internet is a powerful way to connect with people across the globe. With the world wide web in your back pocket, you have access to the answers to all your questions. The internet also allows your customers to educate themselves before making a purchase. Now, online reviews can answer any questions a customer might have about a product. Your customers probably have a lot to say about your products, but why should you include customers reviews in your inbound marketing strategy? Just like you trust the opinion of a friend or family member, customers trust online reviews; in fact, 85% of people trust online reviews as much as a personal recommendation! Educated customers look for businesses who will provide them with the reliable products and services they expect. This means you need to show your customers that you are trustworthy and deserve their business. With 60% of customers believing online reviews to be trustworthy or very trustworthy, you can’t miss the opportunity to use these reviews as a way to connect with leads. 74% of consumers say that positive reviews make them trust a local business more, so If you have great online reviews, potential customers are more likely to trust that you are worth their commitment. Although your strategy may focus on attaining new customers, your current customers are one of your greatest resources. Customer acquisition costs are higher than maintaining a customer relationship, so utilizing your existing base will not only help attract new customers, it could save you some cash too! Customer experience is significant when it comes to maintaining customer relations. One study found of consumers who reported an excellent customer experience, 86% were likely to repurchase, 77% were likely to recommend, and 79% were likely to trust that company, compared to 7%, 13%, and 11% respectively of those who reported a bad customer experience. What about bad reviews? Well, 49% of consumers will ignore a business with less than a 4-star rating, and 22% will not buy from a company after reading a single bad review, which jumps to 59% after three negative reviews. Yikes! Whether leaving a review on Facebook, Google, or Yelp, your current customers are going to influence potential leads who read your online reviews. This is why including customers in your marketing strategy is so important! What should my strategy look like? So how do you include customers in your strategy? Using this system, we can utilize happy customers by keeping them at the center of every stage of the marketing process. 1. Attract: Prospects enter and interact with a company for the first time. Provide value before extracting value! 2. Engage: Convert interested prospects. Make decision-making and purchasing process as easy as possible. 3. 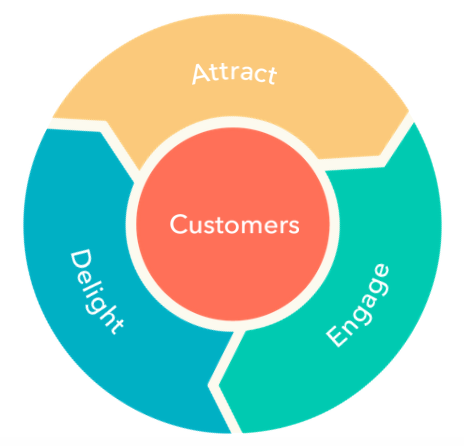 Delight: Customer success is your success. New customers could become future influencers! 1. Identify core metrics you track. 2. Sort your team into stages on the flywheel - maximize word-of-mouth! 3. Identify points of friction between customers and employees that affect customer experience. Hopefully, you now see the role your customers play beyond buying your products and services. Happy customers mean good online and word-of-mouth reviews, and in our new digital world, a strong reputation is a huge advantage. By maintaining strong customer relationships, you will create a base of trustworthy consumers to promote your brand.